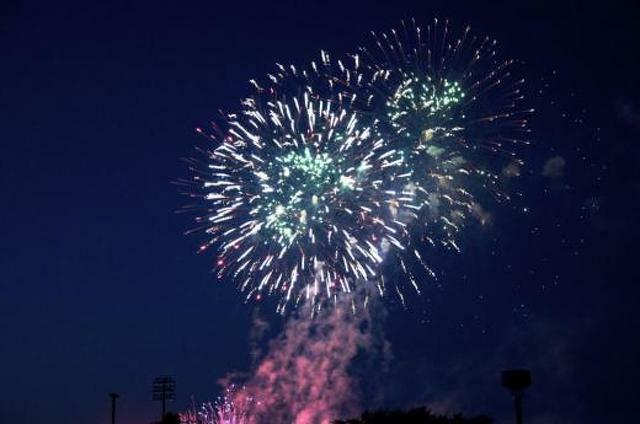 The fireworks show promises once again to be among the nation's best, but Fourth of July also means a day full of celebrations, entertainment, activities and food around State College and on the Penn State campus. Central PA 4thFest kicks off on Wednesday morning and continues on through the pyrotechnic grand finale, which begins around 9:15 p.m. Parking, with a requested donation of $10, is available in lots in the area around Beaver Stadium and Medlar Field, with early bird lots opening at 8 a.m. and general parking at 9 a.m. VIP parking and viewing for a better look at the fireworks are also available. With all there is to see and do, the fireworks remain the big attraction, with about 12,000 shells used in the course of the 45-minute show. "It will be a spectacular show," 4thFest Executive Director Karl Libhart said. "We make an effort to make it bigger and more special each year. There will be some new types of shells in the show." The day will begin with the Firecracker 4k and 4-mile races starting at 9 a.m. on Curtin Road near Beaver Stadium. Day-of registration will be available from 7:30 to 8:30 a.m. in front of the Bryce Jordan Center Ticket Office. The 4-mile race was added in 2016 and has become increasingly popular. "I think two years ago when we started it, it took people by surprise," Libhart said. "Last year we had a bigger number of people signed up for the 4-mile. I know our race registrations are way ahead of what they’ve been in previous years." New this year, the 100 block of South Allen Street will be closed off starting at noon with a performance by Toontown Clowns. Dialed Action Sports will follow with a BMX bike show at about 1 p.m., with ramps set up for plenty of exciting action. Then it's time for the Independence Day Parade, which starts at 2 p.m. near the State College Municipal Building on South Allen Street, then makes its way through downtown and onto campus before concluding at the Jordan Center. It will kick off with the Freedom Bell Ringing, as churches around State College ring their bells. As in past years, the parade will celebrate community and honor local heroes. This year's Happy Valley Heroes will include Centre County Sheriff Bryan Sampsel, state Rep. Kerry Benninghoff, and military veterans Ronald Summers and Mike Williams. They will be honored in a ceremony at noon at the State Theatre then will ride in Corvettes in the parade. Quilts of Valor will honor several veterans with a quilt presentation ceremony, and Operation Thank You will be on hand throughout the day for visitors to sign thank you cards and make donations to help ship packages to military personnel serving overseas. Concessions will be open by 2 p.m., with a wide selection of foods available such as gyros, sausages, pierogies, pizza, tacos, sandwiches, fries, gyros, hamburgers, sno cones, funnel cakes, and many more. Free hot dogs will be available at 4 p.m. outside the Jordan Center and pieces of a giant flag birthday cake will be offered at 6 p.m. outside Beaver Stadium. There will also be lots of educational and patriotic activities from 3 to 7 p.m. on the Founder's Mall behind the Jordan Center. See a list of activities and concession vendors here. 4thFest is an all-volunteer effort, with about 500 people donating their time and effort to make it happen, along with considerable community support. "We always thank the community," Libhart said. "We have hundreds of local businesses that support us with sponsorships and we get a grant each year from the Central Pennsylvania Convention and Visitors Bureau, which we’re very appreciative of." All of the support is needed for an event that regularly draws more than 60,000 people to town to celebrate the Fourth of July. Libhart said this year is shaping up to be one of the biggest crowds in recent years. "Based on our sales of parking passes and VIP passes, we’re going to have a bigger crowd this year than we’ve had for awhile," he said. "Usually our Saturdays are our biggest crowds, but I think with it being on a Wednesday and a lot of people having to work both Tuesday and Thursday, there’s going to be a bigger local crowd because people just stay home to enjoy the Fourth." 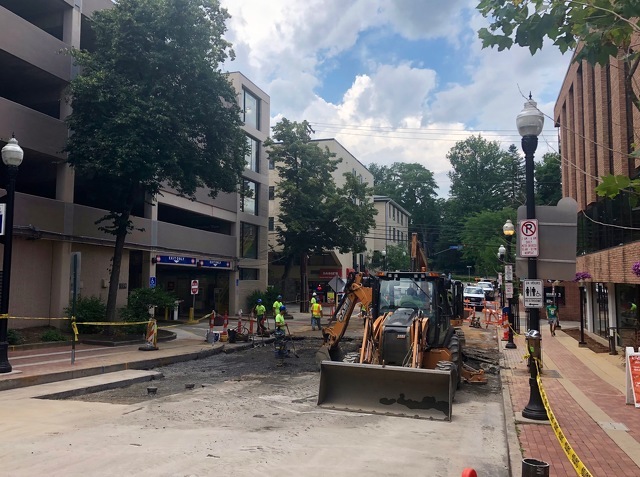 State College Borough Water Authority crews have made line repairs after a water main broke on Sunday afternoon on South Pugh Street, but restoration of the road will continue on Tuesday.